I bought the triplets at Dancing Oaks Nursery; they were trying to get rid of them and had marked the plants down to just $3.50 each! How could I not grab all three? September 2011, having come a long way since early spring! What plant has caught your eye this week? If you blog about it please leave a link in the comments so we can all read about it! Fingers crossed and sending warming thoughts to your root zone Mr. Puya! Maybe that grevillea all around will help protect him? Interestingly, I noticed right off that the tag was from Dancing Oaks. Funny how we remember things. Are you going to put a bucket over Mr. Puya? I think he deserves it. But then, so do all his neighbors. Maybe if things stay dry they'll be okay. I imagine the cold is worse on them when they're wet. Fingers crossed. Grace I have to admit right now Mr Puya is toughing it out. There are too many plants to protect (and who's fault is that, right?). Beautiful!!!! 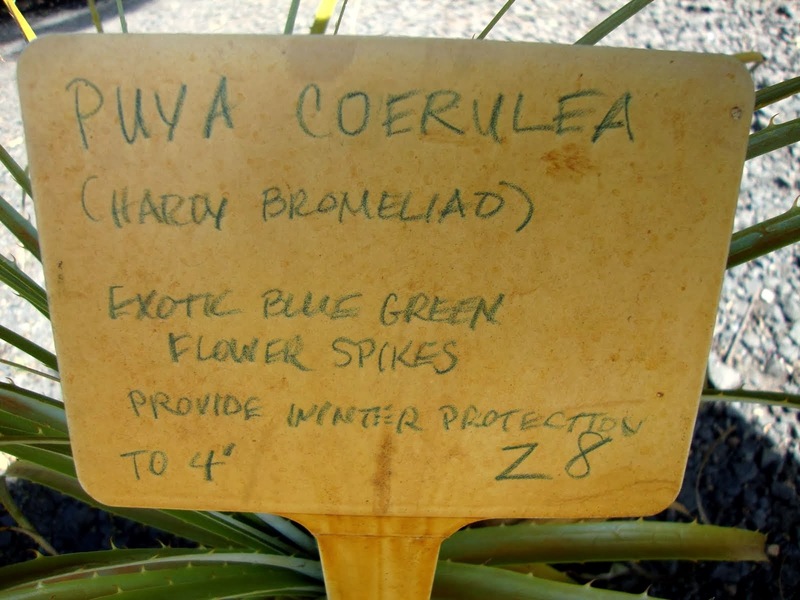 I love the name puya too!! Yours is inspirational. No puyas in my garden - yet. This was the first year planting a dyckia and I'm hoping the weather is kinder than the forecasts are saying. It's still the decade of summer! I'm holding to it and wishing you some clouds to settle over Portland overnight to raise the nighttime temperatures a little bit. Either that or some sort of crazy space heater blasting heat over Cascadia. I'll take that crazy space heater blasting heat over Cascadia! I realize now I've actually got 3 other Puyas in the ground too...augh! Oh man, what a sad farewell! I will cross my fingers that a bubble of warmer air created by a favorable micro climate settles over your yard. That is so NOT boring Fifi! You've got a bit of Portland agave magic right there. Please do let me know what you see if you drive by. 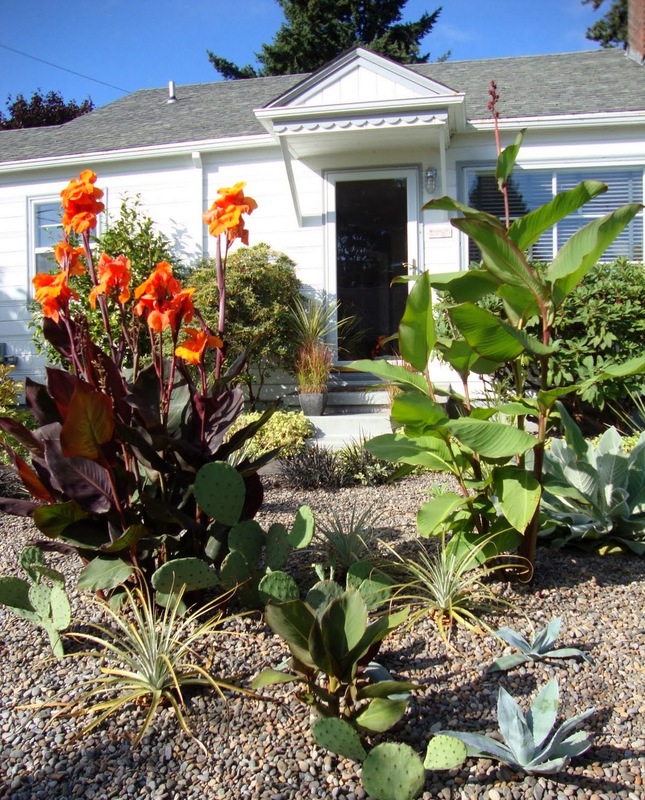 What's the ground-cover-ish plant between all the lovely cacti and agaves? It looks like asparagus fern, but I wouldn't think that'd be one of your picks. I brought my Puya in - I was too afraid to plant it outside. Seriously right!? I noticed that too. What, you don't dig up plants and move them into a more protected area for the winter? I never thought I would, but I did that this year. I have a few things sitting in the garage, potted up. Funny you should ask. On Tuesday afternoon whilst covering and protecting things the shovel did come out, but only once. it was a particularly lovely Acacia cultiformis (knife edge acacia) which I knew would pop right out and into a container and be super easy to save. I hope we don't have to say RIP to your puya, he's done so well lasting this long, and is very handsome. And how crazy has that grevillea gone?! Must be especially happy where it is. I have one in a container, snug under frost cloth. Of course frost cloth only adds a few degrees of protection. Even in Davis we're expecting record-breaking lows this weekend. UGH. So I guess you're telling me when I threaten to move to California (said many times this week) I need to be specific about where I'm going? Okay, Santa Barbara here I come. I love your Puya. 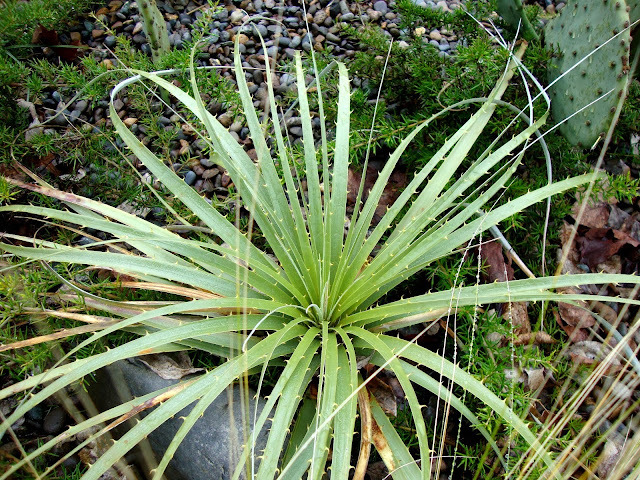 It looks very similar to another Chilean plant that I grow called Fascicularia bicolor. This plant is very suitable for your danger garden as it rips you to pieces with its vicious hooky things if you try to divide it. Good luck with overwintering your Puya. Oh I love that one! 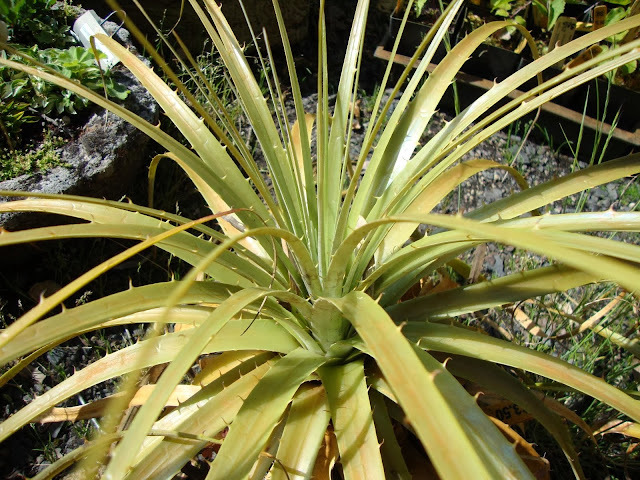 (the Fascicularia bicolor) I have one growing in a container, the one I planted in the ground didn't make it. Love your fav Hannah and I'm with you on both the temps and the longer days. Can we skip January this year and go right to February? Or March?